The government of Jordan has announced it will “protect freedom of expression as long as it is carried out with responsibility and respect of the law.” as opposition parties, reformists and the March 24 Youth Movement (formerly the Jordanian Youth Movement) called for the resignation of the government, the dissolution of the Lower House and the leadership of the security forces after yesterday’s protests (below). The minister announced an investigation has been launched and 21 people arrested following yesterday’s violence which saw more than 150 – 160 people injured and one killed in protests. The minister today called for issues to be solved at the negotiating table, not in the streets and government officials at the press conference put the blame for the violence on the protesters. They announced the police had no intention of removing the protester tents set up. The Muslim Brotherhood, and the March 24 Youth Movement held their own press conferences condemning the police action and holding the government fully responsible for the escalation. Professional associations in the same press conferences announced their withdrawal from the National Dialogue Committee and joined the March 24 movement. The March 24 Movement is refusing dialogue with the government unless the dialogue is formed under a Royal Decree and the agenda includes constitutional amendments to have an elected prime minister and more parliamentary powers. They are also demanding that the Prime Minister Maaruf Bakhit and his government resign and the Gendarmerie Forces be dismantled, along with the restructuring of all security services. They are looking for the formation of a national unity and reformist government that would win the people’s trust and protect their lives,” said Hamzah Mansur, chief of the powerful Islamic Action Front (IAF). “Any government that kills citizens loses legitimacy,” he told a news conference. The son of the protester who died has vowed to not bury his father “We refuse to take his body from the morgue and we will not bury him unless we receive an official apology and the interior minister resigns,” Khairy Saad Jamil’s son, Nasser, 34, told AFP. “We will not move from this hospital until his majesty the king comes here and sees who is to blame,” Jamil’s brother, Said Jamil, told CNN. “We want justice for our brother so his blood is not wasted in vain.” The autopsy said that Jamil died of a heart attack, and had no marks of beating, his family insists the heart attack was brought on by assault and are demanding an amended autopsy report. Bakhit received his appointment on February 1. From WL Central’s coverage on February 1:King Abdullah II sacked his cabinet Tuesday after being confronted with the on going protests by thousands of Jordanians over high unemployment and high food prices. Jordan’s Royal Palace announced that the Monarchy had accepted the resignation of Prime Minister Samir Rifai, who many blame for rising fuel and food prices and poor economic performance. The King has asked ex-army general Marouf Bakhit to form a new government. Bakhit has been prime minister before and also has been an ambassador to Israel so while this change may be prompted by the demands of the people in the streets, it is not seen as any real change in the status quo. CNN reports that their team in Amman on Friday witnessed some security forces beating up anti-government protesters and security was reported to have used water cannons on the protesters. There were also reports of police surrounding hospitals and arresting patients or those trying to enter. Al Jazeera reported two people “killed after being beaten to death by riot police and pro-government loyalists”. AFP reported around 200 government supporters hurled large stones at more than 2,000 young demonstrators. Meanwhile, thousands gathered in Al-Hussein Gardens west of Amman to express loyalty and allegiance to the king, dancing to national songs and waving large national flags and pictures of the monarch. FireDogLake has set up a livestream of the event. WL Central will be covering the Bradley Manning protests in Quantico this weekend. Currently, protesters were warned to leave the site, 118 stayed past the final warning, arrests have begun. FireDogLake reports that the director of operations at Quantico Marine Base issued a “threat advisory” regarding the protests this weekend. Details of the protests and how to get to one here. 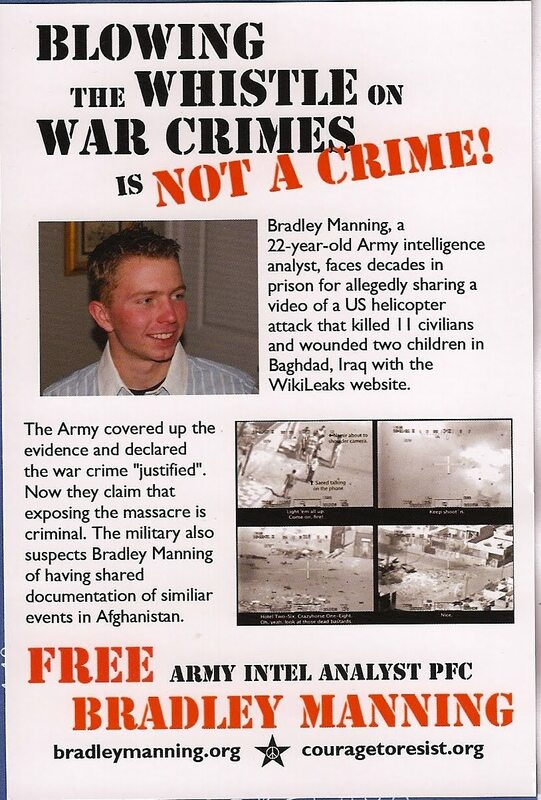 For more information regarding Bradley Manning and supporting him, please go here. As Human Rights Watch joins Amnesty in calling for the US to explain or desist from the abuse of Bradley Manning, support for Manning has increased around the world. MP Ann Clywd questioned UK Foreign Secretary William Hague regarding Manning’s treatment at the meeting of the House of Commons’ Foreign Affairs Committee yesterday (transcript available at UK Friends of Bradley Manning) and she again brought up his treatment today, this time by formally requesting during Business Questions in the Commons that a debate be held on the conditions of Manning’s detention. She explicitly compared Manning’s treatment to that “meted out” to prisoners at Guantanamo. In his reply, Sir George Young, leader of the House of Commons, did not disavow the comparison to practices at Guantanamo. He said that the concerns conveyed by Clwyd are “widely shared” and agreed that Manning’s case was a “suitable subject for debate” in the Commons. Evidence of international concern is shown in the support for Bradley Manning Day below. For the current conditions of his detainment, and the new charges brought against him, please read Is Bradley Manning being treated like a Guantanamo detainee? For additional WL Central coverage, go here. To read an article by former Australian diplomat Tony Kevin on Manning’s detainment, go here. To send an appeal to Cecil B. Wilson, MD, president of the American Medical Association regarding the abuse of medical diagnoses and treatments for torture, written by our correspondent from Holland, go here. For the Amnesty call to action gohere. If you wish to attend a rally and there is none near you, you can start your own by creating an event page somewhere with the date, time and location, and contact us andBradleyManning.org to promote it. Here are ideas to help. Yesterday WL Central reported what seemed to be conflicting reports of assaults by Fateh officers and Fateh officers offering food to the protesters. The offers of food are beinginterpreted as an attack on the hunger strikers resolve and chants today include “No falafel! No cola!” President Abbas sent four jeeps full of food today, to divided reception. Police are assisting in keeping the Fateh and March 15 groups from attacking each other in Bethlehem and broke up multiple fights today. According to Ma’an News reports, the Fateh group seems torn between disrupting or joining the protests. At least 10 students were taken to the hospital today and around 20 were arrested after Hamas plain clothes police and security forces arrived at Al Azhar university and beat up students and blocked anyone from entering or leaving the grounds. Many of the students were planning on attending today’s unity rallies. A spokesman for the Hamas-run interior ministry denied that police had entered the university. “What happened at the university was a problem between students,” Ihab al-Ghussein told AFP. But he was mistaken! At 11:00 in the morning, thousands were protesting at the campus of The Al-Azhar University. It was soon encircled by the regime’s forces and students and girls were again beaten with clubs. When I arrived, there were crowds and crowds of young students being expelled from their own university and hit harshly by clubs. Others were receiving threats and an ambulance was evacuating causality. Actually a couple of ambulances were outside but people were talking about only one casualty. In a day of rare unity, the Palestinian Authority attacked protesters in the West Bank’s Ramallah while Hamas attacked a larger protest in Gaza. The Palestinian populations of both territories also vowed to unite in their call to protest. Between 200,000 and 300,000 people demonstrated in Gaza according to Maan News, calling to end the division of Palestine and unite under the national flag. The March 15 Youth Coalition in Gaza said violence in Gaza City broke out when some 200 Hamas supporters in the Square of the Unknown Soldier carried party flags and beat up protesters who had called for only the national flag. Security forces had set up hundreds of barriers around the square and they beat people with batons and set fire to their tents. Protesters then gathered in Al-Khatib Square. Women and children were very present in the protests, as shown in the videos and pictures below. The few thousand protesters in Ramallah had by evening staged a sit in, singing and lighting hundreds of candles in defiance of the security forces. Maan News is now reporting that tear gas was fired at them and two were shot with tasers, along with other reports of security forces handing out food to Ramallah supporters. Reportedly 20 protesters of the roughly 1000 left in Ramallah are on a hunger strike. Hamas and Fateh had both previously pledged to protect the unity rallies. Gaza’s Hamas premier Ismail Haniyeh responded to the protests by inviting his rival, Fateh president Mahmoud Abbas, to talk. “I invite the president, brother Abu Mazen (Abbas), and Fatah to an immediate meeting here in Gaza … to start national dialogue in order to achieve reconciliation,” Haniya said in a live broadcast after an emergency meeting of his government. And Abbas proposed holding elections “as soon as possible” in order to end the division. “I am with the people and in favour of going back to the people to put an end to the divisions through presidential and parliamentary elections,” he said after talks in Ramallah with Cypriot President Demetris Christofias. Previous coverage of Palestine on WL Central.